Southern resident killer whales are in serious trouble. Their population totals 78, positioning them on a countdown to extinction. In our previous blog, we talked about how the lack of salmon is a threat to orca recovery. Another major threat to their survival and growth is noise in the waters of the Salish Sea. The sources of this noise are varied: oil tankers and freighters, ferries, cruise ships, commercial and private vessels, naval sonar, underwater construction, drilling, and resource exploration. The combination and growth of these sources mean that noise pollution in our waters is on the rise. Here in BC, the number of oil tankers transiting through critical orca habitat would increase to 34 each month—up from five right now—with the expansion of the Kinder Morgan pipeline. That would dramatically increase noise resulting from propellers in the Salish Sea to the detriment of the fragile orca population. And that is just one of many projects being considered in the region which would result in more ships and more noise beneath the sea. Hearing is essential for orcas. They use it to hunt for food, navigate their environment, and communicate with one another. 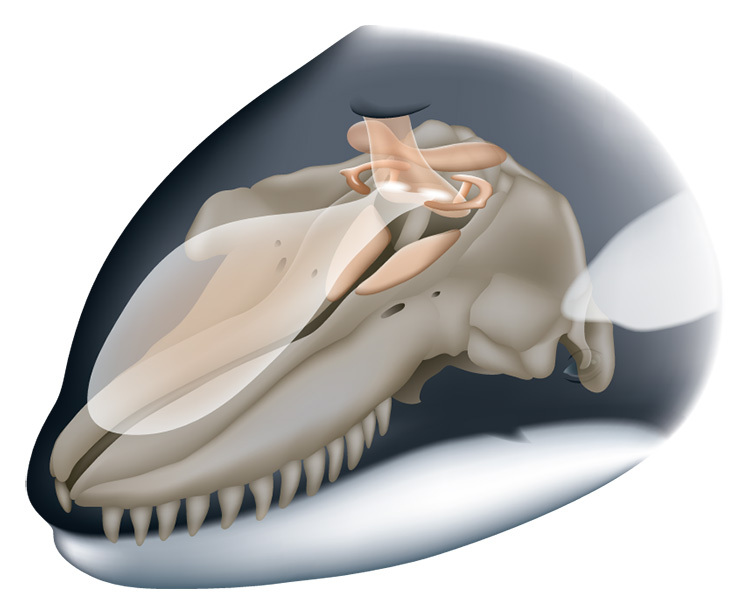 Orcas produce sound by forcing air through the nasal passages in their head. They then focus and project these sounds through their melon, a fat-filled area in their forehead. 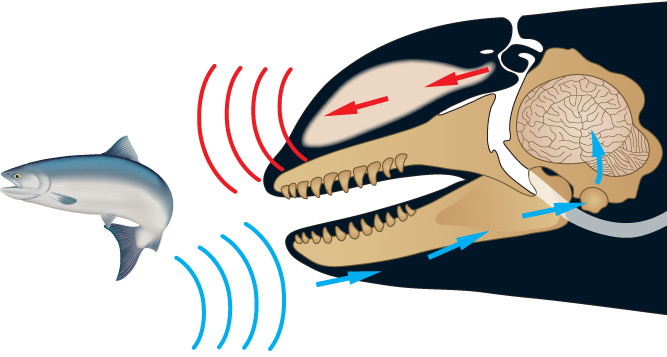 When the sound waves hit an object, whether that be a fish, a rock or a boat, they bounce back and are received through a fat-filled cavity in the lower jawbone. From there, the sound then travels to the inner ear and into the brain where an image is formed. This is called echolocation. Orcas rely on an echolocation sensory system that is the most advanced on Earth—it gives them the ability to ‘see’ what’s in front of them. The ability to ‘see’ using sound waves is not something we can comprehend. Scientists, however, believe the sounds that orcas use to communicate go beyond hunting and navigation. They think it helps tie families together and calms individual orcas who can hear and communicate with their family, making them feel safe and connected. The impacts on orcas of the current and growing noise levels in their critical habitat needs to be better understood. Current noise levels along the West Coast, where orcas live, need to be measured and capped over the longer term, reducing them to levels that do not harm the orcas. To truly protect and recover the southern resident orca community, we need to address the major threats immediately. That requires hard work and commitment from all sectors and levels of government, and even you! Together, we can give orcas a voice and a path to protect their pods and rebuild their numbers. Change needs to start now so we can successfully turn the tides for this unique and important family. Orcas can’t wait—the time to act is now! Thank for taking orcas as important part of our very imortant enology. Hi, do you know if pleasure craft noise worse or better than large commercial? Thank you for reading our blog and submitting a comment. In regards to your question, many factors contribute to how harmful different sources of noise are. Scientists have found that baleen whales, such as humpbacks or gray whales, are more affected by low-frequency noises as they fall within their hearing range. Large commercial ships tend to emit low-frequency sound. Toothed whales such as orca or beluga whales are more sensitive to medium and high frequency sounds, which are often produced by smaller vessels like pleasure craft boats. Sound emitted by any vessel is affected by many factors such as the type of engines, the type of propellers, the speed of the vessel, the distance of the vessel from wildlife, and even the temperature and salinity of the water. I have added a link for you that will provide more information on studies that have been conducted and what scientists have found in regards to noise pollution in the Salish Sea and the effects on whales. I hope this information answers your question. Please Help the Orcas and reduce the sound now that is hurting and killing them. Spread the word, and lets make this a success through common sense, science and better regulation. We must not allow Orcas of the Salish Sea to become one more extinction under our watch. I have seen nothing so far regarding the fact that there is NO METHOD that can be used to clean up DILBIT. If a spill of DILBIT occurs it sinks to the bottom and continues to distribute toxic poison. I have asked if anyone that promotes the shipping of DILBIT can give a cleanup solution,however no answers so far. Also no expert has suggested a way to control tankers that sail under a flag of convenience. These tankers carry the flag of a country that has no agreements in law with other countries of the west. This makes suing the ship owner for cleanup next to impossible and every Canadian politician just shrugs their shoulders when faced with this dilemma. The ship that pumped bunker “C” fuel overboard in English Bay Vancouver should have been forced to clean it up. But the government officials in charge believed the ship owner when he promised he would look after it and allowed him to sail into international waters. THAT DID IT. He tumbed his nose at Canadian govt. offered a lame excuse and never paid a penny. If our govt officials had been using their brains they would have arrested that ship,sent the crew home except the captain and a cook,then towed the ship to the head of Burrard inlet , dropped the anchor and held it until the ship owner came through with clean up costs. We have a lot to learn here in Canada.